When Dave and I barged the Midi Canal in France we started our journey In Toulouse. I made Dave eat cassoulet for dinner on our first night so that he could compare the one made in Castelnaudary. Cassoulet is a dish traditional to the Languedoc-Roussillon region in southern France. No one is quite sure where cassoulet originates, but the two towns of Toulouse and Castelnaudary both claim it as their own. Dave had cassoulet again in Castelnaudary and for a third time when we returned to Toulouse at the end of our trip. This was not a dish I was going to try as at that stage of my life I would not have considered myself a bean eater. 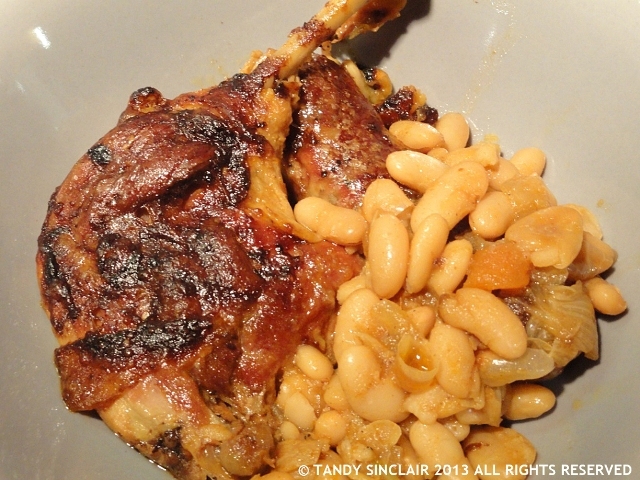 In the south of France the dish is served with way more beans than meat. On our last day in Toulouse we purchased a huge tin of of cassoulet and we served it for friends when we got back from our holiday. When Jo set this month’s I Made It challenge I decided that I would make the dish with fewer beans than is traditional. I was going to make it with chicken, as duck is so expensive but I changed my mind when I saw duck leg quarters at my local Food Lovers Market. It is a labour of love that I would do again as my cassoulet was extremely hearty. Would you go on a barge holiday? You can put your duck fat into a sterilized glass jar for future use – just make sure you remove all the solids. Or you can store the duck leg quarters in the fat in a clay jar for months to make an authentic confit. Bacon is sold whole as kassler steaks. Absolutely amazing recipe. I want to this try with chicken too! A wonderful hearty dish. I little bit of work but looks so delicious! hmmmm just trying to leave a comment, 2nd attempt and fingers crossed…. Great job Tandy. It looks lovely. I have made it with chicken in the past but I am a big bean eater. I think the cheat version is as good Sally! Let me know what you think once you have made it! This sounds fantastic Tandy! I bet it would also be nice and hearty with chicken.